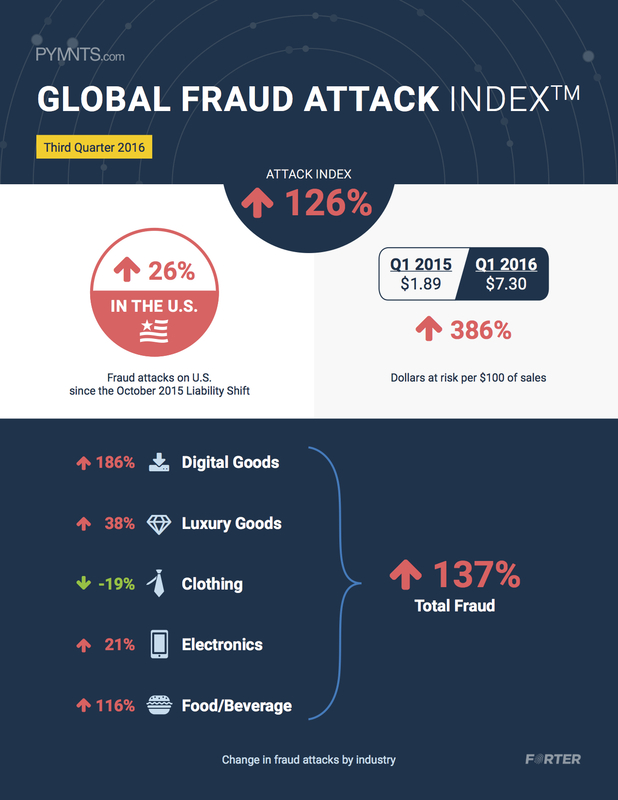 The Global Fraud Attack IndexTM, a PYMNTS/Forter collaboration, measures the rate of fraud attempts on U.S. online merchants and how that changes over time, and takes a closer look at the types, sources and geography of fraud attacks. The report also quantifies the potential cost to merchants, left unchecked, of these attempts based on attack amounts and how these amounts are trending over time. There were 34 attacks for every 1,000 transactions in Q1 2016. That’s a 126 percent increase over the four quarters ending March 31, 2016. The attack rate tripled for digital goods over the same period and more than doubled for luxury goods. The number of attacks from botnets surged from 7 per 1,000 in Q2 2015 to 27 per 1,000 in Q1 2016.